Donuts entered general availability for the following new gTLDs today: .BIKE .CLOTHING .GURU .HOLDINGS .PLUMBING .SINGLES .VENTURES. 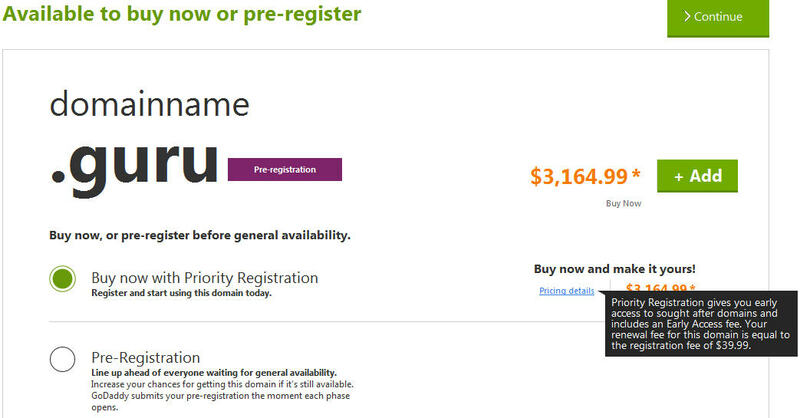 Early access registrations is currently available at selected registrars like Go Daddy. For the first seven Donuts gTLDs that launch, EAP commences January 29, 2014 at 16:00 UTC (11:00 a.m. US Eastern Standard Time) and ends February 5, also at 16:00 UTC. Go Daddy’s early access prices are $12,539.99 for day one, $3,164.99 for day two (now), $1,239.99 for day three, $689.99 for day four and $189.99 for days five to seven. DomainName.Guru and DomainNames.Guru are both available today for $3,164.99 each. Anyone interested? Is domain.guru reserved? Isn’t the whole point of newgTLDs that you could get ‘short’ emds? Yes both domain.guru and domains.guru are reserved. Short emds will be offered in premium prices by their registries. Domain.guru and domains.guru are probably not for sale as the registry might be using them for marketing. So I’m curious as to whether or not the dude that voted for the $689.99 will actually buy it when it drops to that price. Somehow, I suspect not. I think this poll is a very good one that can be applied to any gtld. As a result, I think it’s safe to predict that they will all quickly fail. I will keep an eye on these 2 domains and see if and when are bought. $40 p.a. renewals are a deal breaker. Otherwise I might be tempted. I am against tiered pricing, and it’s a deal breaker for any gTLD as far as I am concerned. I’ve made that clear in the past; the Registries have a strategy and a model that carries them long term, not just during the initial launch.